Extremely anabolic combination of 6 most popular and most effective forms of creatine! The perfect choice for a successful cycle creatine - supports the growth of fat-free muscle tissue! Trec Crea9 Xtreme - 120 kaps. Unique combination of a sports dietary supplement until 9 most effective forms of creatine. Strong stak creatine in the form of convenient capsules. Reach incredible strength and muscle mass! The product of the latest generation, whose members find the most effective substances in the right proportions to maximize their performance. If you expect results just invest in this product. Bet on the effectiveness! 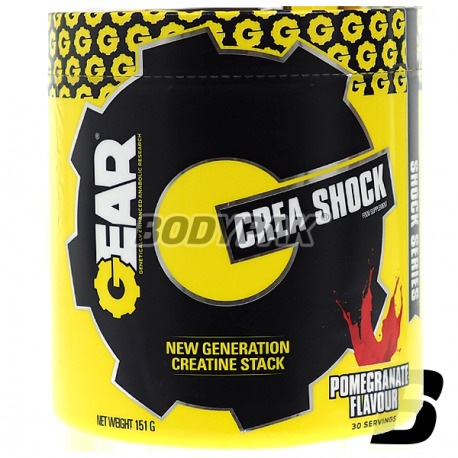 Manufacturer Gear Crea Shock placed only on the active form of creatine that has been enriched, among other things by adding a patented form of beta alanine (CarnoSyn®). With the proper composition of action Crea Shock exceeds all expectations. If you are hungry for success and you strive for maximum acceleration increases lean muscle you should reach for this product. This is an example of craftsmanship the best specialists in the industry of sports supplementation. 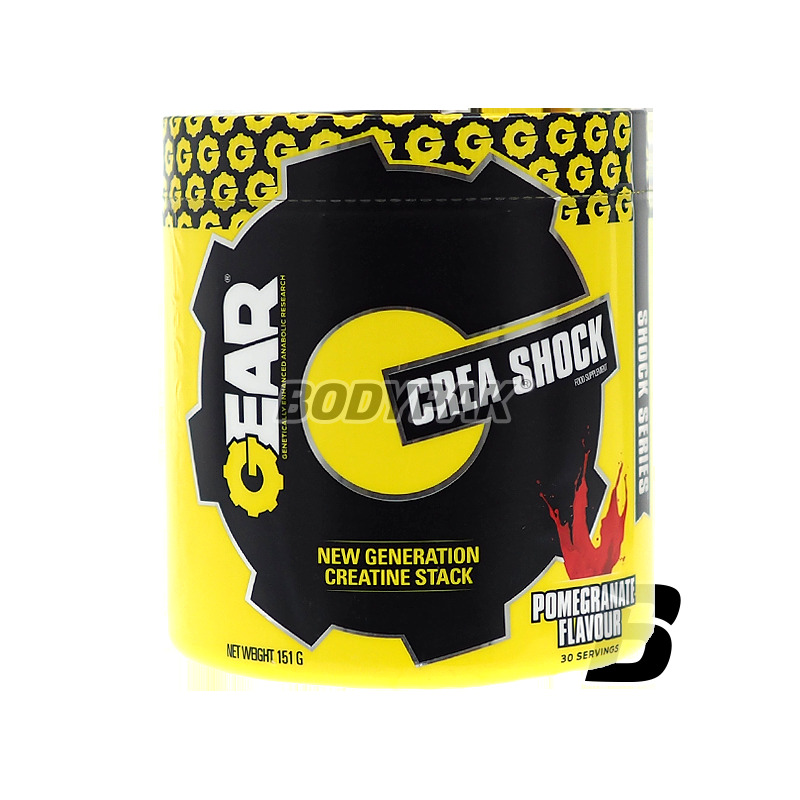 Crea Shock is an innovative creatine stack, which in one product combines two of the most popular and valued forms of creatine, which is nitrate and hydrochloride, enhanced patented beta-alanine (CarnoSyn®) and the addition of an extract of fenugreek seeds. Complete and balanced formula, the components affect each other and complement each other in effective action. Crea Shock is the most perfect composition advanced forms of creatine currently used in the world of sports supplementation. There is composed of cheap creatine monohydrate and no carbohydrates. Creatine in the body is the basic energy vehicle in muscle cells and the appropriate level increases the phosphocreatine content, enabling very rapid re-synthesis of ATP - the direct energy source. All this contributes to increase in intensity and efficiency of muscle work during intense workouts. Considering the fact that creatine increases physical performance in the case of successive short, very intense exercise a beneficial effect is observed with intake of 3 g of creatine per day composition of the product was so balanced to cover this demand and thus ensure the most effective operation. The product composition is formulated such that the release of free creatine molecules is highest immediately after the consumption and covered the demand for this compound under conditions of the greatest exposure to catabolism, after waking up and immediately after the completion of training. The use of these modern forms of creatine guarantees the achievement of the most diversified kinetics of the release of free creatine molecules and minimal losses of the substance, ie transformation to inactive creatinine. For greater effectiveness of the applied and enriched Crea Shock patented beta-alanine (CarnoSyn®) and extract of fenugreek. Acting synergistically can very effectively influence the increase of the volume of each workout, helping to improve athletic performance, while reducing to a minimum recovery time after training. Beta-alanine as CarnoSyn® patented beta-alanine molecule. Beta-alanine in the body plays an important role in regulating the amount of current carnosine - a substance neutralizing the presence of lactic acid in the muscle developed due to intensive training, . Beta-alanine is an intracellular buffer which has a buffering capacity in hydrogen ions (pH stabilization muscle), wherein said donor is lactic acid. The hydrogen ions block the possibility of further work striated muscle by impairment of the nervous system communicate with the muscle tissue, which leads to the breakdown process in an efficient muscular contraction. Amino acids in natural conditions are generally in the form of alpha-amino acids, but the supplementation of beta-alanine, owing to this appears to be appropriate and desirable. In order to support metabolic processes and energy of the body Crea Shock has been fortified with vitamin B6, which helps to maintain normal energy metabolism, protein metabolism and glycogen and helps to reduce fatigue and znużenia.Crea Shock is recommended for anyone practicing a physical activity without regardless of their current level. Baguet A. et al. Carnosine loading and washout in human skeletal muscle. J Appl Physiol. 2009. And Harris RC. et al. The absorption of orally Supplied beta-alanine and its effect on muscle carnosine synthesis in human vastus lateralis. Amino Acids, 2006. Genialne połączenie kreatyny HCL i azotanu - na prawde robi robote! Newest monohydrate Olympus complex CREA Loading DB-6 system is a cheap and effective dietary supplement for strength and muscle mass. It has been shown that even small doses of the measure allow you to get a strong anabolic effect. Trec CM3 - 360 kaps. This is a preparation containing in its improved creatine formula in its most bioavailable form which is 100% creatine malate (tri-creatine malate). With this product significantly improve achieved increases muscle mass and strength! The advanced formulation based on several forms of creatine, which has been enriched with vitamins and minerals. It supports fast and sustainable growth of muscles and accelerates the development of physical strength! High-quality active substances, in suitable doses. Advanced preparation, so that you increase your physical stamina, and you speed up the development of your muscles! Clever formula based only on effective active ingredients. Bet on the quality!